It’s all there in the name – a utility knife has a number of uses in your household or anywhere, really. Whether you are looking to open up boxes or strip wires, this is the knife that you turn to. Of course, considering the importance and versatility of this tool, you do have to be careful about the one that you get. This is because, despite appearances, not all utility knives are created equal. Some are true works of art while others are barely usable. The best utility knife is going to have a sharp blade, a proper extending and retracting system, a good grip, and be made of durable materials. Since it can be tiresome to wade through all of the options on the market, we are taking on that challenge for you. Here is what we found when we went looking for the best utility knives. One of the best things about this particular knife is that it has been designed to have multiple uses. In fact, for some of these features, you don’t even need to use the blade! This is because this knife comes with an integrated gut hook at the rear of the knife and a wire stripper at the front, making it easy to access. The wire stripper is able to strip up to 10 gauge wire. The knife is composed of an all-metal body ensuring that it is incredibly durable and will last you a long time, regardless of the conditions that you use it in. You will also find that it is an absolute breeze to extend the blade. It can be activated three times faster and only requires one hand. Changing the blade is just as simple as it is a tool-free method. The only unfortunate part of this, though, is that the blade has a tendency to dislodge whenever you are trying to cut something overly thick and firm. Also, there is no built-in storage for the other blades. The knife has an excellent handle where you can comfortably keep your fingers so that you are able to get a better grip on the knife, thus making it a lot safer for you to use. The knife is also small, making it easy to store in pockets but it also comes with a wire-form clip for your belt. One of the trickiest parts of using a utility knife is the blade. This is why it is important that the blade remains within the confines of the knife until you want to remove it. Well, with this particular model, you don’t have to worry about the blade falling out. It has a safety lock which ensures that the knife stays in place at all times. Speaking of the blade, yet another great feature on this knife is that it comes with 5 additional blades. What’s more, the blades can be contained within the chamber. As a result, you also get a self-loading blade, making this an even safer option to use. Of course, there is little use in all of these blades, if they don’t actually function well. This is why you will be glad to hear that the stainless steel blades are very sharp and easily cut through boxes, ropes, and carpet, wires, and more. What’s more, the blades are rust-proof and designed to last for long as well. The downside to these strong blades, however, is that it makes the break-off process tricky. This can often take several tries and even then, you might not get a clean break. The good news, though, is that casing is just as durable and well-designed as the blade. It has an easy to grip TPR handle which makes using this knife rather simple. This isn’t just a regular utility knife – you will find that this DEWALT knife is even easier to store and carry around as it is foldable. This, as you can imagine, isn’t even the best part of this knife. What really makes this utility knife stand out is its design and construction. To start with, let’s take a look at the blade. It is made from a heavy-duty metal which makes it perfect for cutting through a variety of materials without worrying about dulling the blade. The retractable blade is easy to extend and shorten as well as hold in position, at a specific length. Thanks to this feature, you will find that you can customize the depths at which you can cut the materials. 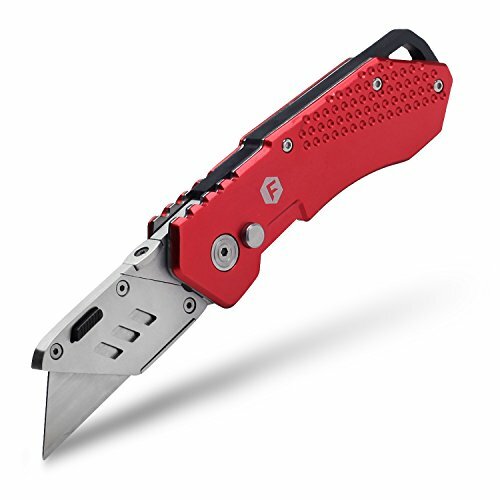 Now, this utility knife is equipped with a Rapid Load blade changing system and while this should make switching out the blade easier, this isn’t necessarily the case. See, it can be rather tricky to push the blade into its setting, especially since the instructions aren’t very helpful. Apart from this, however, the utility knife does have a blade storage feature so that you can store the blades on the knife itself. This makes it easier for you to switch out the blades on the fly. The casing and the grip on this utility knife are also made from high-quality metal, ensuring that it will last quite a while. The rubberized handle allows you to get a good grip as well. 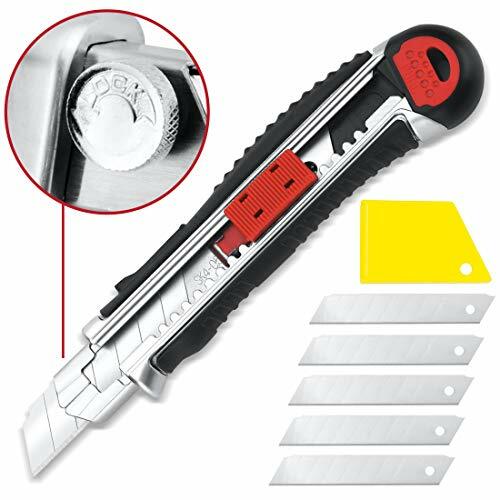 If you are tired of messing around with slider locks and similar mechanisms, then this is the utility knife for you. You will be hard-pressed to find a knife that is easier to use than this. With just a click of a button, you can get the blade to extend or retract. Not only does this make your job a lot easier, it also ensures that your fingers stay away from the blade at all times. To top this off, it really doesn’t get any simpler to switch out the blades than with this knife. This is because the additional blades are kept in a built-in storage area. By removing the old blade and pressing down on the grip, the new blade automatically pops into place and is ready to be used! Speaking of the grip, it is made from a matte material which makes certain that your fingers don’t slip and are able to hold the handle properly while you are using the knife. The knife is composed of zinc alloy so you can be quite sure that it is able to cut through different kinds of materials with ease. It is also more likely to last you a long time. The main disadvantage with this blade is the size and heft. It is a bit bulky and heavy which can make it tricky for some people to use. There really is a lot to like about this pocket utility knife. For instance, it is lightweight and can be easily folded. This makes it easy to store or to carry around with you in your pocket or your toolkit. It also has a clip that allows you to attach the knife to your belt. What we appreciated most about this knife, though, was the toughness of the blades. The blades are made of heavy-duty carbon steel, allowing them to cut through most of the materials that you will work with. Extending and retracting this blade is also a breeze. Plus, once the blade is in the right position, there is an auto-lock back feature. This prevents the blade from budging at all, while you are using it. The utility knife casing is also built to be rather durable. It is made from anodized aluminum and is complete with a non-slip grip. Now, you get 5 additional blades with this knife and you will notice that it is relatively easy to switch out the old blades for new ones. The main hassle with this utility knife is that there is no built-in storage for the extra blades. So, you have to find another way to carry them around with you. There are two main types of modern utility knives that you will have to choose from – the fixed utility knife and the retractable utility knife. With this knife, the blade is exposed at all times and it can’t be shortened. Now, the main advantage with this type of knife is that it is steady enough to cut through thicker or tougher materials. As such, you will find them used for DIY projects and even construction sites. The downside of these blades, however, is that they also pose a bigger risk. Since the blade can’t be retracted, there is a greater chance of cutting yourself with this knife. This type of knife is also referred to as a self-retracting blade. One of the top benefits with these knives is safety. Since the blade is drawn in with the help of a slider lock or button, you don’t have to make contact with it, reducing the chance of injuring yourself. Another perk is that you can also tailor the length of the blade, allowing to cut at different depths. Nonetheless, these blades aren’t as steady or as stable as the fixed blades. So, it is not unusual to find these blades either falling out or pressing back in while you are using them. Under this type, you can also find folding utility knives. As the name suggests, these knives can be folded in half, making them easier to carry and store. With blades, you will have to choose between traditional metal blades and breakaway ones. To do this, you will need to first think about the advantages and disadvantages of each blade type. On average, the traditional blades tend to be stronger and thus more capable of cutting through tougher surfaces. As you can imagine, it also makes them more dangerous for you to handle. You can also put greater amounts of pressure on these blades without being afraid that they are going to snap or break in any way. The main issue is that when these blades dull, your only real option is to through them away. Now, depending on how often you use your utility knife, this could get a bit pricey. With the breakaway blades, it is just a matter of snapping off the dull portion when you can’t use it anymore. This way, there is an untouched edge ready for you to use, making these blades more economical. The process of snapping off the blade can be rather risky, though, so you will need to be careful. Not to mention, these blades are often not as tough as the traditional ones. Utility knife blades can be made from a variety of different metals – anything from carbon steel to stainless steel. Now, the precise material that you choose, should depend on the kind of requirements that you have in mind. For instance, if you need a truly heavy duty knife, then you may want to go with the carbon steel option. On the other hand, if you want one that can withstand the elements or outdoor use, you may want to consider stainless steel. A major aspect of any retractable utility knife is the retracting mechanism. While the precise design changes from knife to knife, there are some features that should remain constant. To start with, you should check that the sliding mechanism is smooth so that the blade can extend and retract with ease. The mechanism should also be placed in a position where your fingers can stay away from the blade, guaranteeing your safety. You should also be able to lock the blade in place both when it is extended as well as retracted. This feature, too, allows you to avoid injury. You are always going to want to keep extra blades with you, wherever you go. This way, if you do happen to snap the blade, you don’t have to stop your work. Of course, to be able to do this, you will preferably need a knife with a built-in blade storage feature. This way, you don’t have to find another place to keep the blades. Comfortable Grip: you need to be able to hold the knife comfortably and properly while using it. This is why a non-slip, ergonomic handle is important. It will ensure that you are able to keep a good grip on the knife at all times. Hang Hole: if you want to keep your knife on hand at all times, you should look for a hang hole-type feature. This will allow you to hang the knife from a belt loop or similar feature. Additional Features: if you want a more versatile knife, then look for one with extra features. This could include a wire stripper, gut hook, and more. So, to wrap things up, you need a utility knife that cuts well, is durable, easy to use, and keeps you safe from injuries. If you are looking for a truly heavy-duty utility knife, then you will find that the Kutir and the Fancii utility knives are your best option. 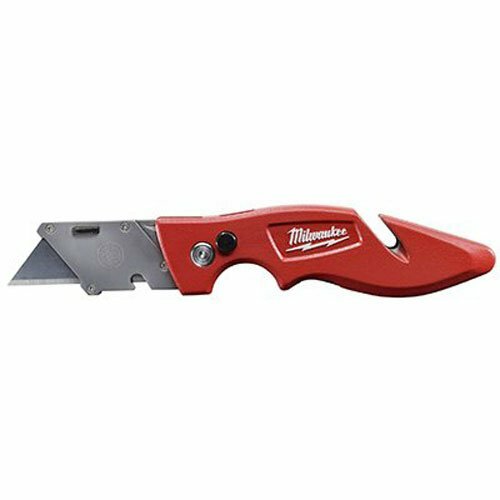 If you want one that is incredibly easy to use, then the Alltrade utility knife will be the simplest to work. 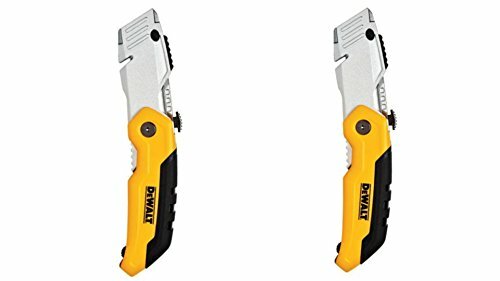 On the other hand, if you want durable knives that will last a long time, then the Milwaukee and DEWALT utility knives will be a great choice. These are all of the things that you need to be aware of when choosing your utility knife. This way, you are sure to make an excellent decision.